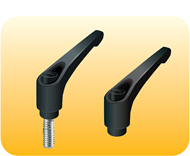 Reinforced nylon handles with cap and female brass insert or zinc plated steel threaded stud. Just depress the cap to easilly park in the desired position. Ideal for use in tight spaces. 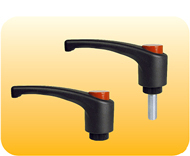 Heavy duty diecast zinc-plated handles with clamping action. Black passivated or stainless steel, male and female, inserts. 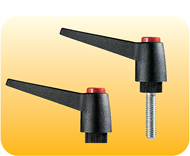 High-impact resistant thermoplastic handles with cap and female brass insert or zinc-plated steel-threaded stud. Depress the cap to easily park in the desired position. Ideal for use in tight spaces.